The results of the study principally confirm the still very vivid internationalization process in the examined industry sectors. On average, 45 per cent of the production sites of the machinery and plant engineering sector and 66 per cent of the production sites of the automotive supplier industry are located outside of Western and Central Europe. Thus, the production is already hugely distributed – and there is an upward trend. There is an apparent dependency between the customers and the industries that results from the high degree of internationalization. The examined markets will experience medium-term changes: The interviewed companies plan to locate new production sites primarily in East Asia and South America. South Asia is also growing, but only half as much as South America, whereas Eastern Europe and Russia have stagnated. According to the study, twelve of the examined companies currently operate at least one production site in South America, and 24 in East Asia (including Southeast Asia). In the next few years these numbers will increase so that there will be 18 production sites in South America (50 per cent increase) and 29 in East Asia (20 per cent increase). Although the number of production sites in Eastern Europe will remain the same, fewer companies will produce there: only 20 of the 22 companies that currently operate at least one production site there will continue to produce in Eastern Europe. Overall, the interviewed companies plan to open 55 new production sites and to close 13 old production sites: Therefore, the number of production sites will increase by 42. More than half of this net increase will take place in East Asia, where 20 new production sites are scheduled to be constructed. The high growth rates in East Asia confirm that this region has become an inevitable production location for local industries. However, there are differences between the examined sectors: The majority of these new productions sites (15 in total) are being built by the automotive industry, whereas the engineering industry only plans to erect five new sites. The next highest capacity gain is planned in South America where eleven new production sites are scheduled to be built. Here, the automotive supplier industry experiences the biggest growth rate again, with nine of the new sites planned. Five new production sites are planned in South Asia where expansion is smaller but generally positive. The distribution of closures is interesting: The number of new production sites and the number of closures are quite balanced in North America as well as in Western and Central Europe – eight new sites and eight closures. This also applies to Eastern Europe and Russia. In the medium term, regarding new investments in production sites for the machinery and plant engineering sector and the automotive supplier industry, emerging markets in the Eastern European region will experience a similar saturation to that of the highly developed markets of Western Europe and North America. According to the participants of the study, Eastern Europe and Russia are comparatively less likely to improve their relevance as industry production sites. Nevertheless, internationalization of production progresses quickly due to the construction of new production sites: The planned 55 new production sites that will be added to the already existing 385 production sites constitute a capacity increase (measured in production sites) of 14 per cent gross, and after deducting the closures still roughly eleven per cent. As expected, the study demonstrates that those who stand to lose out from this development are traditional industrial countries such as North America, and those in Western and Central Europe. Surprisingly, neither Eastern Europe nor Russia will profit from the additionally created capacities. According to the investment plans of the interviewed companies, the winners are principally East Asia, especially China, and South America. South Asia, primarily India, also profits from scheduled investments, though to a lesser extent. The expectations of the participants concentrate on these regions. 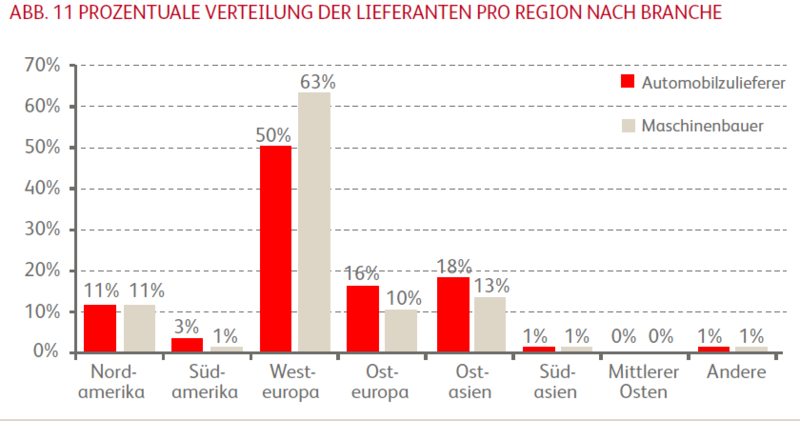 Developments in the procurement sector differ from planned investments in new production sites: Western and Central Europe are currently the most dominant regions regarding the distribution of suppliers. On average, roughly 56 per cent of all suppliers are from this region. East Asia occupies the second place with approximately 15 per cent, followed by Eastern Europe with almost 13 per cent and North America with approximately 11 per cent. Interestingly, 15 per cent of the interviewed companies stated that more than 50 per cent of their suppliers are already located outside of Western and Central Europe. 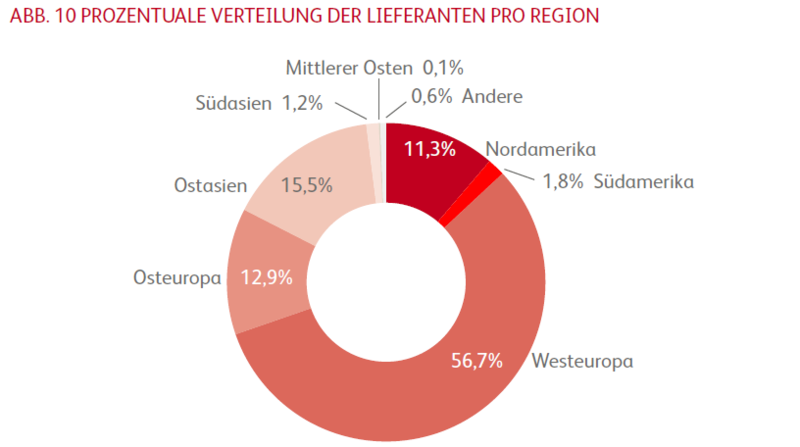 In accordance with a more conservative attitude regarding production sites, the machinery and plant engineering sector tends to obtain their parts largely from suppliers that are located in Western and Central Europe: 63 per cent of the suppliers are located in this region. The expected trend for the procurement sector is also a rather modest growth for the traditional markets in North America, Central and Western Europe as well as Eastern Europe, whereas East Asia displays a substantial growth of 15 per cent over five years. Surprisingly, South Asia, e.g. India, is expected to have a far higher potential in the procurement market in comparison to the investments in production sites. The growth in procurement is estimated to be at least 17 per cent. However, at present, this only counts for a very small basis for procurement: Only approximately one per cent of the participants’ suppliers are currently located in this region.